Two hundred and nineteen million dollars was spent on this amazing structure. When you enter the Museum you come into a vast open space. In the center is a ceremonial circle where pow wow drummers and dancers were performing, filling the beautiful structure with the sounds of celebration. Looking up four stories you see a circular opening in the rotunda where light is directed down in the center of the circle. The circle is surrounded by a copper wall. Words can't describe the sacred feeling of this monument to the American Indian. Branching off from the central area are galleries each representing a different tribe. There you are shown the beliefs and traditions of the Native Indian, embellished with ancient artifacts beautifully preserved and displayed. The museum will become, and is without doubt, a great learning institution for the millions of visitors who will pass through for decades to come. The most memorable for me were the Seven Teachings of the Anishnabe which are, "Honesty, Love, Courage, Truth, Wisdom, Humility, and Respect." I couldn't help the tears, as I paused with reflection of the historical past, the time when they were called "savages" by the Euro-settlers. My time spent at this historic event was like that for me. As I became personally acquainted with Chiefs of different tribes, and spoke with various people from all over the continent, time and time again I heard them express their pride for this moment. It was a time of healing, of reflection, and new vision of the future. It was also a time of discovery for all, learning from each other that they are the survivors of the horrible past, embracing one another, exchanging stories and renewing bonds they once had many years ago. Everything has at long last come full circle in a celebration of renewed hope. I concluded my week long experience attending a stage production called "SPIRIT The Seventh Fire." I could have seen this 10 or more times over. 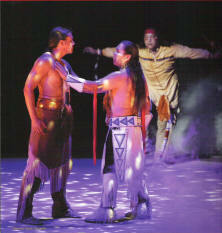 The actors, the regalia, the dancers, the music, and the message were timeless and inspired. The house was packed every night it ran, and standing ovations that seemingly would never end. And what could have topped this, only that the cast stood at the gate as we were leaving to shake every hand and sign autographs. Conceived and Produced by Peter Buffett. Executive Producer was Entertainment and Concert Promotion, Inc. Creative direction by Peter Buffett and Jody Ripplinger. Music composed by Peter Buffett and Chief Hawk Pope. Original choreography by the Spirit Performers. Production and design by Chris Jones. Film direction by Frank Anderson. Story by Peter Buffett, Jody Ripplinger, William Morgan and Chief Hawk Pope. Production development by Image Technologies Corp.. Sound design and production Associate Chris Anderson. The message was simple yet profound especially for the Native Indian, "You must become the rock the river cannot wash away. Speak your voice. Dance." We hated to leave this moment and return back to our daily lives again. My friend Marcelino Tabango (Inca), who shared in this experience with me, we walked together down the National Mall. The moon was not quit full, the Mall was empty now where once thousands of people had gathered in this grand celebration. We talked about the fabulous things we had seen and heard, how our hearts and minds were opened to the possibilities of a new beginning. I looked to Marcelino and saw a newness about his spirit. I reflected on the day I walked from the Lincoln Memorial where I read his words that, "all men are created equal, one nation...", I visited the war memorials, the great museums, and it all overwhelmed me with emotion. When I stood in front of the Constitution and Bill of Rights at the National Archives and wept. I pondered the greatness of the human spirit, the courage and the power that even one person can have to make a difference. I stood where Martin Luther King gave his speech, "I have a Dream," and thought how this inspired man had helped open the way for this great event to happen in our time, "free at last...."
"Hear The words of the Tecumseh: The seventh generation will bring my people back... We are the seventh generation, we are like seeds in the rich earth after a hard winter. One more remarkable and personal moment happened when I spoke with an Elder standing alone. I spoke to him and told him I was on a quest to understand the American Indian people when, he took hold of my hand and said, "You need to pray to Creator and ask him what your purpose is and whatever the answer he gives you follow it and never look back." The Elder was Chief Leon Lockleer. There is a road in the hearts of all of us, hidden and seldom traveled, which leads to an unknown, secret place." - from "Spirit and the Seventh Fire"